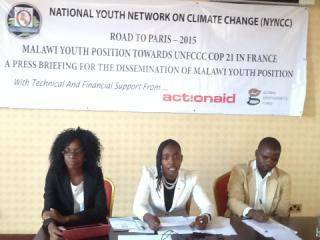 The National Youth Network on Climate Change (NYNCC) has called on the Malawi Government to fully utilize the youths if the country is to develop. This was disclosed on Thursday in Lilongwe during the launch of position paper on COP21. Youths speak during the meeting. “We, the participants of the various youth consultation sessions held across Malawi on “Road to Paris”, under the Umbrella body National Youth Network on Climate Change (NYNCC) welcome the opportunity for engagement and appreciate the space to have our voice heard, Noting that Malawi has in the recent past experienced a number of adverse climatic hazards such as prolonged dry spells, seasonal droughts, floods, and increased outbreaks of environmental related diseases such as malaria and cholera;” Read the position paper which was presented by NYNCC Board chair Nassily Mskani. Mskani said youths are concerned that various climate hazards have negative impacts on youths lives and livelihoods such as loss of property and life, and that communities suffer irretrievable loss of farming livelihoods. The youths said they were already aware about the fact that agriculture is the mainstay of Malawi’s economy and heavily dependent on rain and unsustainable inputs such as chemical fertilizers. In this vein, the youths accused the habit of illegal cutting down of trees which results in deforestation. Mshani also Welcomed the engagement of the youth by the government of Malawi on climate change, including the decision to accredit youth delegates to COP 21 and other previous COPs as well as inter-session meetings. “We recognize that youths and children are one of the most vulnerable groups to climate change-related disasters, and loss and damages associated with climate change impacts; and that they will be the beneficiaries of the globe and have a stake in securing their future,” Said Mshani. However Ms Mshani was quick to bemoaned that a large cohort of youths is impacted by unemployment, poverty, poor infrastructure and inadequate basic social services and public utilities arising from the adverse effects of climate change. Noting that Malawi has a youthful population with nearly three quarters of the population below the age of 30 a phenomenon that poses both challenges and opportunities to the well-being of the country and we concerned that there is inadequate participation of young people in various climate change programmes in Malawi,” Said Mshani. Mshani was quick to note the complexity of the negotiations on climate change at various international levels such as United Nations Framework Convention on Climate Change (UNFCCC) Conference of Parties. The paper has since highlighted the need for the Youths involvement. This is a violation of their human rights guaranteed by the Republican Constitution and Chapter 25 of Agenda 21 adopted at the 1992 UN Conference on Environment and Development, in Rio de Janeiro we demand that the youths should be engaged in all climate change activities from decision making to implementation and monitoring both locally and internationally. Lets move on young people ! Ukachenjera manja udya nawo. Tiye nazoni ma youth.